Tomorrow, hundreds of thousands — make that millions — of Chicago Blackhawks fans will flood the downtown area for a parade and rally to celebrate a truly remarkable achievement: The Chicago hockey franchise winning the 2013 Stanley Cup. I’m certain many members of the Blackhawks faithful will don their long-sleeved team sweaters emblazoned with the name of their favorite player on the back. This, even though we’re three days away from July. I won’t attend, but will be there in spirit; something to do with avoiding crowds. However, I did attend the 2010 celebration. Read about it here. In a June 12 post, I predicted the outcome: The Blackhawks would win Lord Stanley’s trophy, certainly the coolest in all professional sport, in six games against the surging and powerful Boston Bruins. Hey, I was right! Perseverance Pays Off. The Stanley Cup playoffs, like life for most of us, are filled with highs and lows — only done on ice by tough men on skates holding sticks while chasing a hard rubber disc. Down 3-1 in the second round, the Blackhawks roared back to defeat the Red Wings, then the Kings and finally the Bruins. They didn’t give up, even after key players like captain and center Jonathan Toews was hacked and speared and cross-checked mercilessly at times, or when they couldn’t capitalize on power plays. They played through these adversities; they persevered and they won. Role Players Count. Epitomized by players like Andrew Shaw, a 21-year-old winger with more guts than brawn, and Michal Handzus, a wily, veteran center, some members of the roster were on the ice to fill a role. They may not get the glory afforded the team stars, but their very presence, grit and determination to fill that role made them indispensable and critical to the team’s success. In sports, and perhaps in life, too, role players are like Tonto: There would be no Lone Ranger without them. Leaders Lead Best When It Gets Tough. During the quest for the Cup, the Blackhawks were bashed for losing faceoffs, not scoring on power plays and for failing to push back hard when being battered by the usually bigger opposing players. That led to criticism of Coach Joel Quenneville, Towes and defensive leaders like Duncan Keith. But over 21 playoff games, these leaders were calm, steadfast and assertive when responding to media questions. They lead through wisdom and example. 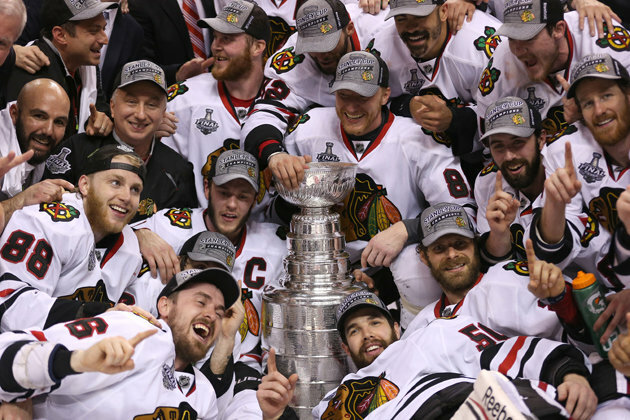 Now it’s time for a virtual faceoff: What did you learn from watching the Chicago Blackhawks’ Stanley Cup run?